Post Graduate Teacher (PGT) Mathematics - 1 Post UR Quota - Basic Pay 9300 Grade Pay 4800 in Pay Band II category - MSc Mathematics / M.Math. with B.Ed. 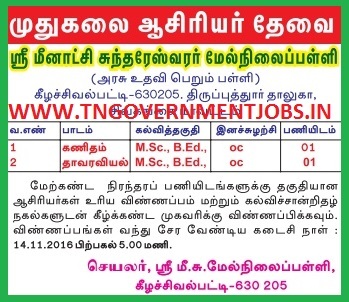 Post Graduate Teacher (PGT) Botany - 1 Post UR Quota - Basic Pay 9300 Grade Pay 4800 in Pay Band II category - MSc Botany with B.Ed. The above postings are in permanent category (Government Aided School). Interested and eligible candidates may apply to the following address on or before the last date 17th November, 2016.